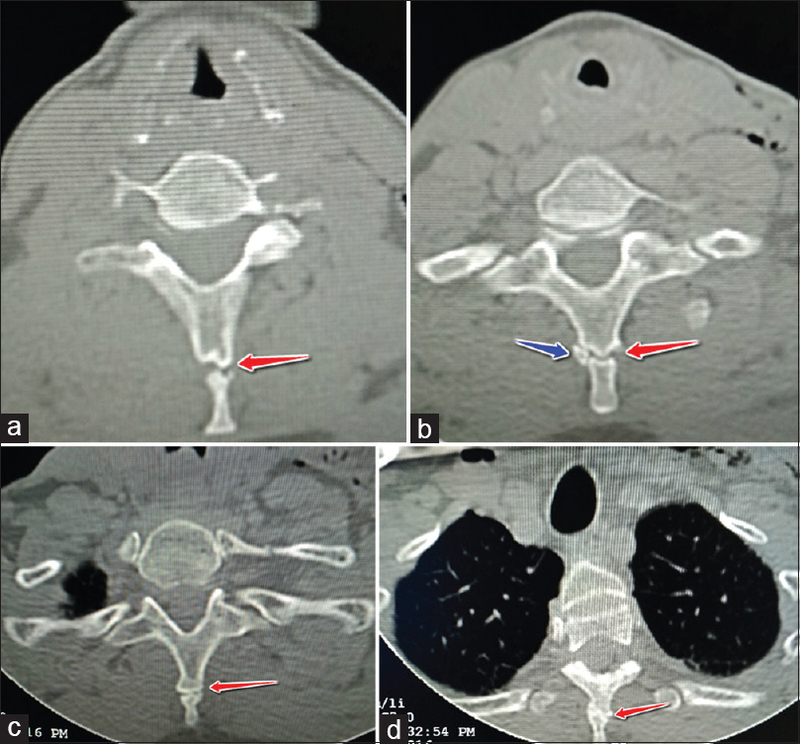 This is the first reported case of nonunited secondary ossification centers presenting as multiple aberrant articulations involving the spinous processes of vertebrae C7–D3. It is important to know that variations, such as these exist to prevent false labeling as fractures. A 59-year-old male patient presented to the emergency department of our hospital with a history of fall from the height of about 3 m. The patient gave no associated past history of motor vehicle accident or occupational injury. General physical examination revealed tenderness in the region of the left clavicle. Radiograph of the chest, computed tomography (CT) head, and CT cervical spine were requested as part of the imaging workup. Chest radiograph revealed left clavicular fracture at the junction of medial two-third and lateral one-third. CT head did not reveal intracranial hemorrhage or calvarial fractures. CT cervical spine showed no evidence of fractures, dislocations, or spinal canal stenosis. However, we incidentally detected the articulations of spinous process at multiple levels from C7–D3. An accessory ossicle was also demonstrated at the D1 vertebral spinous process level [Figure 1]a,[Figure 1]b,[Figure 1]c,[Figure 1]d. Physical examination elicited no tenderness of the spine at these levels on reexamination postimaging. A thorough search of literature showed no such reported case until date. The differentials, we considered, were clay-shoveler's fracture and nonunited secondary ossification centers. Clay-shoveler's fracture is a rare type of stress avulsion fracture of the lower cervical and upper dorsal spinous processes and has its name originated from clay-shoveler's of the past times. This type of injury is mainly encountered in rotational movements at the junction of cervicodorsal spine. However, in our case, the interspinous distance was well maintained, and the articulations of the spinous processes had rounded and well-corticated edges as opposed to the edge of a fracture which appears angulated without cortication. Nonunited secondary ossification centers can simulate an avulsion fracture of the tip of the spinous process. However, the key features include the opposing margins being smooth and sclerotic, distal nonunited segment lying in proximity to the remainder of the spine without caudal displacement, and the nonunited segment possessing a concave margin which is continuous with the convex surface of the opposing segment of the spinous process. On the contrary, spina bifida is a developmental fusion anomaly with an open neural arch or a bifid spinous process often with spinal cord involvement. Prenatal diagnosis of spina bifida by ultrasound enables the termination of pregnancy. Individuals who survive to birth will require surgical intervention and other associated defects have to be dealt with including the Chiari II malformation, hydrocephalus, urological, and orthopedic sequelae. At development, sclerotomic tissue migrates from both sides of the centrum and surrounds the neural tube. Neural spine forms at the junction of the right and left neural arches. Sclerotomic tissue also extends laterally from both sides of the centrum to form a coastal process (ventral) and a transverse process (dorsal). The bony halves of the vertebral arch fuse together during 3–5 years. The arches articulate with the centrum at the cartilaginous neurocentral joints. However, these joints disappear when vertebral arches fuse with the centrum during 3–6 years. Developmental anomalies of the vertebrae are variable and may range from single level to the extent of multiple levels throughout the length of the spine. Spinal defects can be broadly divided into – anterior vertebral body defects, segmental defects of the vertebral bodies, and neural arch anomalies of which posterior arch defects constitute the majority with or without a meningocele or myelomeningocele. To conclude, multilevel nonunited secondary ossification centers presenting as aberrant articulations involving the spinous processes are a rare entity, and its knowledge can prevent radiologists, orthopedicians, neurosurgeons, and emergency medicine physicians from falsely labeling such entities as fractures and can help preclude further intervention in such patients. Baker BK, Sundaram M, Awwad EE. Case report 688. Fractures of the spinous processes of multiple thoracic vertebrae. Skeletal Radiol 1991;20:463-4. Cancelmo JJ Jr. Clay shoveler's fracture. A helpful diagnostic sign. Am J Roentgenol Radium Ther Nucl Med 1972;115:540-3. Yamaguchi KT Jr. Myung KS, Alonso MA, Skaggs DL. Clay-shoveler's fracture equivalent in children. Spine (Phila Pa 1976) 2012;37:E1672-5. Bowman RM, McLone DG. Neurosurgical management of spina bifida: Research issues. Dev Disabil Res Rev 2010;16:82-7. Knutsson F. Growth and differentiation of the postnatal vertebra. Acta radiol 1961;55:401-8. Noback CR, Robertson GG. Sequences of appearance of ossification centers in the human skeleton during the first five prenatal months. Am J Anat 1951;89:1-28. Wynne-Davies R. Congenital vertebral anomalies: Aetiology and relationship to spina bifida cystica. J Med Genet 1975;12:280-8.